There are some GREAT Christmas signs out there but I wanted to make my own this year. 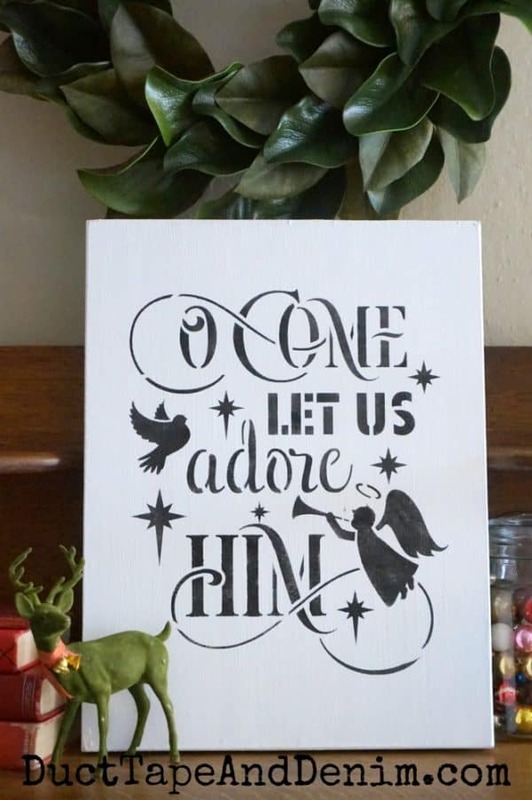 So I created this simple O Come Let Us Adore Him Christmas sign from a $4.99 thrift store find. Here’s what the sign looked like before I painted it. It was just a printed, mass produced sign like you might find at T. J. Maxx or Ross. Not a bad sign… but not the style I was looking for. Sign up for my FREE 12 Days of Christmas Crafts email series!!! 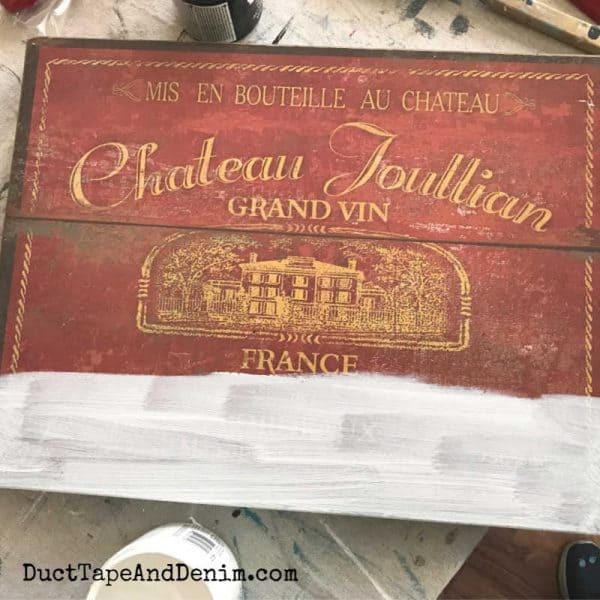 NOTE: If you’re a visual learner, scroll down to watch the video where I stenciled this on Facebook Live. It took a couple of coats of white paint to cover the previous graphic on the sign. Probably 2 1/2 coats. There were a few stubborn places I had to go back and touch up. Even before stenciling, I added a coat of varnish. That’s my usual technique when I’m using chalk-type paints. It allows me to distress the stenciled part without removing the base coat. And the colors won’t bleed into each other. When the varnish was dry, I used washi tape to hold the Christmas stencil in place. Sometimes I use spray adhesive to hold my stencils but washi tape worked well for this DIY sign project. Then I just pounce the paint onto the stencil. It’s better to do several light coats instead of one heavy coat. Once the black paint was completely dry I went back over the sign with another coat of light satin varnish. How do you like my vintage deer? I found her at a thrift store YEARS ago. One of her antlers was bent but I just glued it back and she’s been adorning my Christmas vignettes ever since. I add a few vintage red books and glass Christmas ornaments in a jar, too. Now the ideas are flowing… how many of these signs can I make before Christmas? They would make great gifts for some of my friends and family PLUS I’m going to make a few to sell at my holiday markets. These have been my favorite stencils so far. My favorite thing about them is that every design comes in multiple sizes. Now go stencil something! We share at these blog parties. I loved your sign. I hope you do them in different color combos. Red-maroon/gold; dark blue/silver; green/white, etc. I bet you will sell them all and your friends/family will LOVE them. I know I would! My commercially made “It’s a wonderful life.” stays up in my front hall year round! 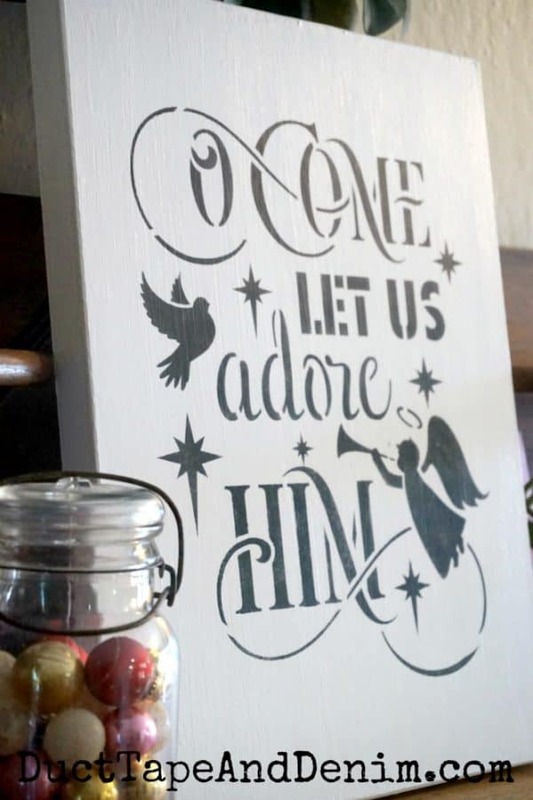 I prefer religious to Santa decorations (although I love him, too!). One year my ex came to visit and asked me why I had 2 Nativity sets out. I said, “Because I can!” If I had more space free, I’d collect a LOT more! Your sign is Beautiful! Pinned. Great sign. I pinned this! Thanks for sharing at the To Grandma’s House We Go DIY, Crafts, Recipes and More link party. Hope to see you again next week.